Now that Halloween is just around the corner, where do you think the scariest things happen? At work, where grown people spend eight (or sometimes more) hours a day. And that’s not a surprise: a missed deadline is a much more terrible thing than a spider jiggling in the web. And, these nightmares are not a product of a vivid imagination, they happen in real life and make everyone shiver even at the very thought of them. 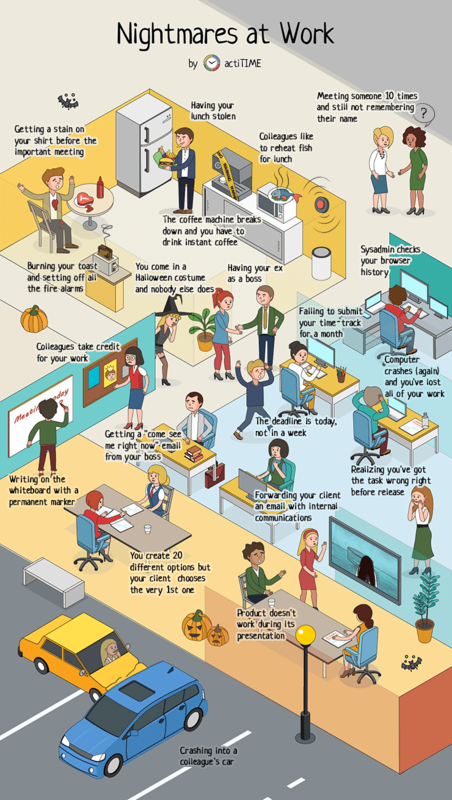 This infographic from actiTIME time tracker provides a Haloween edition of nightmares at work.